The middle rounds seem to be the place where a lot of fantasy owners “make up ground” on positions that they ignored in the first half of the draft. Whether it happened on purpose or it was a part of a bigger strategy, there is a lot of value in the middle rounds this season. If you are a person who likes the “zero RB” strategy, there will be some volume still out there in the 6th round and later. If you are like me and you are a fan of getting a couple of elite running backs in the first three rounds, wide receiver happens to be really deep this year in a league where the air game is always growing. This is also a season where it might be a good idea to grab up one of the better tight ends in the first five rounds because of the value to be had in the middle rounds at other positions. While others are taking quarterbacks and forgetting how close quarterback scoring ends up being at the end of the season, here are some guys who can help you win your league. 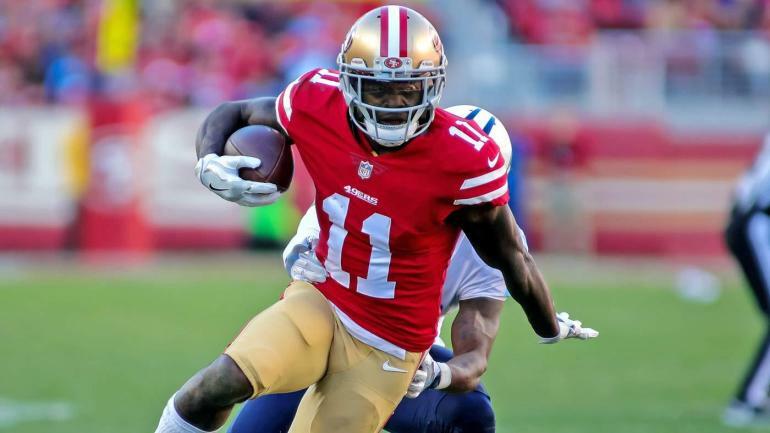 Marquise Goodwin takes some flack in the fantasy community for being too “big play dependent.” Early report out of San Francisco have consistently suggested that Goodwin is Garappolo’s most preferred target throughout camp, so far. Marquise’s spring ADP also suffered because of the assumption that a healthy Pierre Garcon would be the WR to target. The secret isn’t quite out yet to a certain extent. On average, you can still get Goodwin in the beginning of the 7th round in standard leagues and the 57 catches that he had last year aren’t going to force his value any higher in PPR leagues. In Garcon’s absence last season, Goodwin had a stretch in weeks 13-15 where he had no less than 6 catches in a game and 319 yards total. The problem with projecting San Francisco wide receivers is trying to figure out who will provide help in the red zone. We all want those 6 fantasy points, afterall. Data from last season proves that Goodwin finished 2nd on the team with 15 red zone targets, which was only one behind the leader, George Kittle. At the end of the 7th round sits the volume guy who is being drafted behind Carlos Hyde, Tevin Coleman, Marlon Mack, and Sony Michel. Can you wholeheartedly tell me that any of these guys will see a bigger share of the work than Isaiah Crowell? Even if one or two of these players see a boost that I don’t expect, the only way that Crowell doesn’t outperform his ADP is if he misses a large chunk of time due to injury. In each of the last two seasons, Crowell has averaged over 4 yards per carry on his way to two straight seasons with over 1,000 all-purpose yards. I mentioned earlier that you should let your other league mates take quarterbacks in these rounds. I make an exception for a quarterback who should finish in the top 5 at his position as long as his shoulder holds up. While we’re on the subject, the only other quarterback that I am targeting earlier than the 10th round is Cam Newton. But, I digress. 2014 and 2016 were Andrew Luck’s previous healthy seasons. In each of those years, he threw for well over 4,000 yards and threw for 40 and 31 touchdowns, respectively. He was also able to complete at least 61.7% of his passes in each of those years as well. It also helps that the offensive coordinator of the 2017 Super Bowl champions is now his head coach. Luck’s favorite explosive target, T.Y. Hilton, will provide a lot of big play ability to go along with a quality safety net in Jack Doyle. The offensive line may only be slightly better than it was in previous seasons, especially after the surprise retirement of Jack Mewhort. But, the addition of Quentin Nelson should provide immediate improvement. There is not a lot of statistical data to back this up, but I get the feeling that Sammy Watkins is going to be a big part of this offense. A solid all around receiver will be very beneficial to Patrick Mahomes for filling voids that Tyreek Hill may not be able to do as well. For one, Watkins was never able to stand on solid ground in the Ram’s offense last season, but was able to still manage to find the end zone eight times. Watkins will surely see more targets in this offense than he did in L.A. It also doesn’t hurt (no pun intended) that he had a pretty healthy season last year. We should just assume that Kansas City didn’t give Watkins all that coin to be a decoy. Rex Burkhead is a big climber nowadays in the world of ADP. He’s made his way all the way up to the beginning of the 6th round. Last week, I wrote about how the injury and suspension bug has made Chris Hogan a very viable draft target. The story is no different for Rex Burkhead. Burkhead should see a large chunk of snaps, especially since it will take Sony Michel some time to get acclimated with the offense after he recovers from his knee injury. As a dual threat back in an offense that likes to air out the ball and is lacking in options, Burkhead should be a PPR monster, especially early on in the season. Follow me on twitter and join my RCL League. My gut says wait on QB and TE but thinking of bucking this trend as their is minimal point difference between wr’s 10-20, and some sleepers late like Goodwin and Mike Williams for example. @MB: I fully expect Jones and Allen to be gone by my 2nd pick. I think maybe Green, Adams, Hilton, Evans, Fitz, Thielen, Diggs would be available. Plus, I have a suspicion the #1 guy will pick Gronk with his 2nd or 3rd pick. Would you dump anyone for Taywan Taylor, Anthony Miller, Gore, Ginn, Perine, Enunwa or Rishard Matthews? @MB: Thanks. Missed out on a lot of my mid round targets. Like Miller too!I will have to drop someone to add a DST by week 1. Monty, Martin or Ware? DS Watson or K. Cousins or A. Luck? my heart says Luck , and you look to agree ! who would be the last 3 keepers? @Nick: Collins, Engram, and my heart also says Luck but my brain says Watson. I think Luck is a great value at his ADP but I think Watson has the better season. He’s taking a beating for being a statistical outperformer. He clearly has overall QB1 potential, just too expensive in redraft for my taste. I’m going stars and scrubs and need to make a final keeper choice. Either Marlon Mack at $3 or Jax D at $1. I’m nervous about Mack’s quad injury and playing time threats. Think he could bust even at $3. What do you think? got a dynasty draft (2 QB half PPR 12 teamer) starting tomorrow, and i’m way behind (do plan to and will read/listen to all razzball info since SB here shortly), where is a good dynasty rankings list around here currently (or somewhere else if not here)? thanks. if no exact list yet exists here (odd if it didn’t though, this is about to be draft season) i could list roster. i’m aware that in 2 QB dynasties QB’s obv go up in value over a standard list, sometimes by a lot. my team in general is RB needy though so my 1st rounder this year will likely be a RB, also i have good QB depth (somewhat, they aren’t all starters), weak RB depth, esp if this burkhead injury is a large thing; a week or so ago it sure LOOKED like i had gained big value owning him still. it’s only a 3 round draft and i have all my picks in the first 34 (10th in each round). @Joey Jo Jo Jr Shabadoo: yeah the Burkhead thing is rough, but it sounds like he’ll be good to go for week 1. No harm no foul. I’ve been trying to find one or two dynasty writers for a while but they are hard to come by. I’d recommend dynasty football factory. @MB: b-don and donkey teeth (same guys who do the since-july-or-so aligned with razzball baseball podcast) have a pretty good podcast here on dynasties (3 of them thusly, RB, WR and TE + QB ones), and b-don gave me a top 33 for 1st year drafts list. i will check out dynasty football factory as well, thanks for the reference. -a bigger issue is the IDP lack (albeit jay’s rankings last year were VERY good for a 1st year guy doing that), best spot is IDP guru, that guy is informative, similar to the guy razzball used to have like 2 or 3 years ago who for 2 straight years i believe was the BEST ranker in the entire industry (albeit there are few IDP rankers, at least on FP), kevin i believe was his name. he got married and likely jobbed up, which retired him. @Eli Man Penguin Boy: I’d keep Fitz. I want all the Fitz shares this year.